When Logging in for the first time you will need to reset your password. Use the email address that you provided to BAMOM when you renewed/signed up. 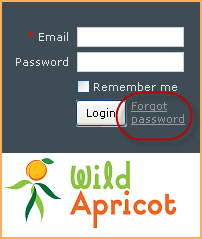 If a member or other contact forgets their password, they can click the Forgot password link that appears beside the Login button on the login screen. On the screen that appears, the contact enters their email address and clicks the Submit button. An email will be sent to the address they entered with a link they can click to change their password. For security reasons, the link will expire within 24 hours of the message being sent.